Being a village of great antiquity, Abyaneh is like a living architecture and anthropological museum. Affords it an impressive exponent of the adaptation of man with his environment It is located on the north-western slope of Mt Karkas, 2 kms away from Natanz (a town in Isfahan province). It is 2500 meters above sea level. At a place called Hanjan, a road connects Abyaneh to the main road of Kashan-Natanz. Hanjan is 55 kilometers away from Kashan and 25 kms away from Abyaneh. Abyaneh is mainly watered by the river of Barzrud. Set on the slope of the lofty mountain of Karkas, this village has a cold climate and enjoys numerous springs creating a favourite condition for agriculture. Considering the evidence found in Abyaneh , it dates back to antiquity , but its golden age was during the Safavid period. The word Abyaneh has been derived from the word ―viona ‖ meaning Willow Grove. ( in the local dialect ―vey‖ means willow.) The village is expanded along the river, and its configuration indicates that in the past the people showed much consideration for security. Although the village itself is situated on high ground, there are three castles that protected the people when the enemy attacked. Furthermore, the configuration of Abyaneh protects it from strong winds and floods. Abyaneh has a compact fabrication with narrow and steep alleys. Set on the slope of the mountain, the houses are arranged in a stair-step shape, so that the roofs of some houses are the yards of the others. The materials used for building the roofs are timbers, straw and clay. The walls, built by red mud brick impressive (Due to the presence of sulfur and copper mines soil is red). The mud bricks are of quality that becomes harder when they are exposed to the rain. To use the sun as much as possible, the houses face the east. 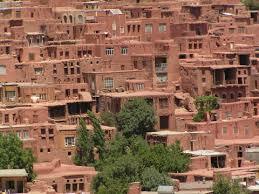 An impressive aspect of Abyaneh`s architecture is that the houses are uniform in appearance. The doors, most of which have two knockers, are wooden and built in traditional styles. There are beautiful patterns, poems and the names of the owner and mason carved on some doors. These poems afford a good picture of the old Iranian culture. Many facets date back to the Safavid period. Beside the door of many houses there are small platforms providing places for passers-by or local residents to rest for a while. The simplicity found in Abyaneh‘s houses affords a picture of life in rural Iran. Each room is used for various purposes. For example, a single room may be used as a dining-room, a living-room, a bed-room and a guest-room. To economize in the use of fuel, the rooms used in winter are architecturally different from those used in summer. For providing equal light 31 for all parts of the rooms, there are several small openings in the roofs. the size of the rooms , windows and doors all indicate the simplicity of life in this old village. Abyaneh is called an entrance to the Iranian history. In some of the houses there is earthenware belonging to a few hundred years ago. The local traditional clothes are in styles of great antiquity . It is said a woman of Abyaneh has inherited her wedding dress from her grandmother. The language spoken by the people is similar to the parthian language ( an Iranian language of the people who were inhabitants of an ancient country to the southeast of the Caspian Sea , now a part of ne Iran) . In addition to natural beauties, there are several historical monuments in Abyaneh, of which the following are of more significance.